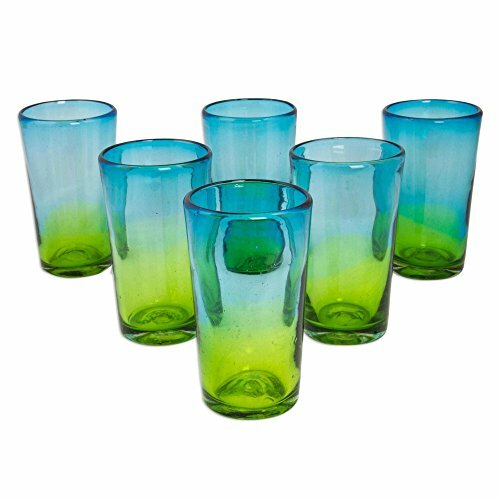 Aquamarine dissolves into a vibrant lemon hue in the refreshing design of these highball glasses. Designed by Javier and Efren each glass is crafted with Mexican blown glass techniques, in which artisans blow through a metal pipe while twirling it with one hand. They simultaneously shape the molten glass at the other end, expertly achieving this color effect. Because each piece is handmade, shape and size can vary slightly and tiny bubbles may appear within the glass. This exemplifies the hand-blown technique, making every piece a unique example of blown glass craftsmanship. Size: 6" H x 3.5" Diam. ; Capacity: 15 oz.